Nintendo GBA Game published 16 years ago by Destination Soft. Wing Commander - Prophecy © 2003 Destination Software. North American release. Game developed in Europe. 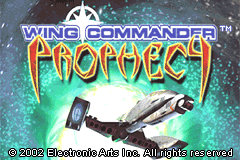 See "Wing Commander - Prophecy [Model AGB-AW9P-EUR]" for more information about the game itself. Released on June 04, 2003 in USA.